Saturn, the sixth planet from the Sun, is named for the Roman god of agriculture, who was based on the Greek god Cronus. The second largest planet in the solar system, it measures almost 75,000 miles (120,600 kilometers) in diameter at its equator. Despite its large size, Saturn is the least dense of all the planets. 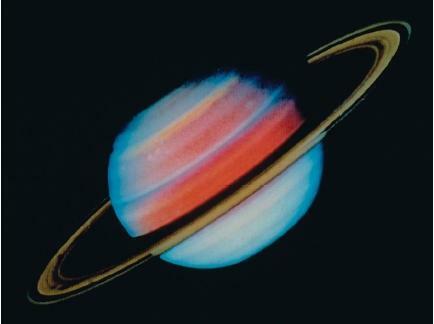 It is almost 30 percent less dense than water; placed in a large-enough body of water, Saturn would float. Saturn completes one rotation on its axis very quickly, roughly 10.5 Earth hours. As a result of this spinning, the planet has been flattened at its poles. The measurement around its equator is 10 percent greater than the measurement around the planet from pole to pole. In contrast to the length of its day, Saturn has a very long year. Lying an average distance of 887 million miles (1.4 billion kilometers) from the Sun, Saturn takes 29.5 Earth years to complete one revolution. Saturn consists primarily of gas. Its hazy yellow clouds are made of crystallized ammonia, swept into bands by fierce, easterly winds that have been clocked at up to a speed of 1,100 miles (1,770 kilometers) per hour at its equator. Winds near the poles, however, are much tamer. Covering Saturn's surface is a sea of liquid hydrogen and helium that gradually becomes a metallic form of hydrogen. This sea conducts strong electric currents that, in turn, generate the planet's powerful magnetic field. Saturn's core, which is several times the size of Earth, is made of rock and ice. The planet's atmosphere is composed of about 97 percent hydrogen, 3 percent helium, and trace amounts of methane and ammonia. Scientists estimate the surface temperature to be about −270°F (−168°C). atmosphere, which causes ammonia to bubble up, solidify, and then be whipped around by the planet's monstrous winds. Saturn's most outstanding characteristic are its rings. The three other largest planets (Jupiter, Uranus, and Neptune) also have rings, but Saturn's are by far the most spectacular. For centuries, astronomers thought the rings were moons. 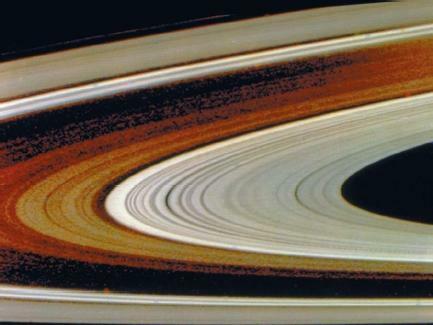 In 1658, Dutch astronomer Christiaan Huygens first identified the structures around Saturn as a single ring. In later years, equipped with stronger and stronger telescopes, astronomers increased the number of rings they believed surrounded the planet. In 1980 and 1981, the Voyager 1 and Voyager 2 space probes sent back the first detailed photos of Saturn and its spectacular rings. The probes revealed a system of over 1,000 ringlets encircling the planet at a distance of 50,000 miles (80,450 kilometers) from its surface. The rings, which are estimated to be one mile (1.6 kilometers) thick, are divided into three main parts: the bright A and B rings and the dimmer C ring. The A and B rings are divided by a gap called the Cassini Division, named for it discoverer, seventeenth-century French astronomer Giovanni Domenico Cassini. The A ring itself contains a gap, called the Encke Division after German astronomer Johann Encke, who discovered it in 1837. The Encke Division contains no matter, but the Voyager missions found that the Cassini Division contains at least 100 tiny ringlets, each composed of countless particles. Voyager confirmed the existence of puzzling radial lines in the rings called "spokes," which were first reported by amateur astronomers. Their nature remains a mystery, but may have something to do with Saturn's magnetic field. Saturn's outermost ring, the F ring, is a complex structure made up of several smaller rings along which "knots" are visible. Scientists speculate that the knots may be clumps of ring material, or mini moons. While scientists do not know the full composition of the rings, they do know that the rings contain dust and a large quantity of water. The water is frozen in various forms, such as snowflakes, snowballs, hailstones, and icebergs. The forms range in size from about 3 inches (7.6 centimeters) to 30 feet (9 meters) in diameter. Scientists are also not sure how the rings were formed. One theory states that they were once larger moons that were smashed to tiny pieces by comets or meteorites. Another theory holds that the rings are pre-moon matter, cosmic fragments that never quite formed a moon. Saturn has 18 known moons that have received officially sanctioned names from the International Astronomical Union. In late 2000, astronomers detected up to twelve possible new moons orbiting the planet, some at a distance between 6.2 and 12.4 million miles (10 and 20 million kilometers). These have all been given provisional designations, but scientists believe only six out of the twelve may turn out to be real moons. All the known moons are composed of about 30 to 40 percent rock and 60 to 70 percent ice. All but two have nearly circular orbits and travel around Saturn in the same plane. Christiaan Huygens discovered Saturn's first moon Titan, in 1655. It is the only moon in the solar system with a substantial atmosphere, which is composed mainly of nitrogen. Voyager 1 revealed that Titan may have seas of liquid methane bordered by organic tarlike matter. Titan's thick blanket of orange clouds, however, prevent a direct view of the surface. The Cassini orbiter, which was launched in October 1997, will deliver much more information about Saturn and its moons. With a budget of $3.4 billion, it is the last of the National Aeronautics and Space Administration's (NASA) big-budget, big-mission planetary probes. Cassini, which weighs nearly 13,000 pounds (5,900 kilograms), carries 18 scientific instruments that will take a variety of measurements of Saturn's atmosphere, its moons, and the dust, rock, and ice that comprise its rings. After traveling some 2.2 billion miles (1 billion kilometers), the orbiter is scheduled to arrive at Saturn in mid-2004. It carries with it a probe, called Huygens, that was built by the European Space Agency. The probe will drop onto the surface of Titan for a detailed look at the moon's surface. If it survives the impact of its landing, Huygens will transmit data from the surface back to Cassini for up to 30 minutes. After releasing the probe, Cassini will orbit Saturn at least 30 times over a four-year period, gathering information and sending back more than 300,000 color images taken with an onboard camera. GREAT INFO GUYZ!!! HELPED A LOT ON MY SOLAR SYSTEM ASSIGNMENT.GOOD TO KNOW THERE'S ONE SITE YOU CAN COUNT ON. One theory was that scientists thought rings were once larger than moons and then hit by space objects and broken up. Why didn't the pieces of the moon just fly off into space, instead of collecting in rings around the planet? Is it because of the magnetic field it has. Is it true that it has a magnetic field why or why not?